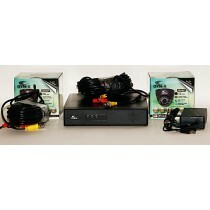 Two Camera High Definition CCTV Kits. 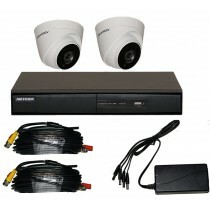 The kits include 2 Cameras, CCTV Recorder with Hard Drive, 2 X 20 metre Video/power cables and 1 X Four way 5 amp Power supply that can power 4 CCTV Cameras. These kits also include free delivery. Introducing the very latest in High Definition CCTV Equipment at very special pricing from the World's leading manufacturer of CCTV equipment. We are delighted to announce that we now stock the HIKVision range of Turbo Analogue HD recorders and cameras. This new range features amazing HD quality at 2 Mega-Pixel full 1080p, the same quality as a Sky HD box. What it means to you is that you now get amazing HD quality in an easy to install package with everything included. The 2 channel Kit comes with a 1TB Hard Drive as standard. Full HD uses up more HDD space, so a small 500GB hard drive just won't be enough. This is the new DS-7204HQHI-K1 with H.264+ & H.265 compression. When enabled it will double the storage capabilities of the recorder, giving it equal storage to a normal 4TB H.264 recorder. This is our lowest cost High Definition HIKVision Kit ever and it uses the very high quality HIKVision premium Turbo brand. It costs less, but you do not lose out in quality. Even more incredible is that the included HD cameras have the best IR NightVision in their class. The dome cameras can see in total darkness for upto 40 metres and the bullet cameras can see an amazing 80 metres in total darkness. Both of these cameras are far, far better at night vision than comparable cameras from other brands. 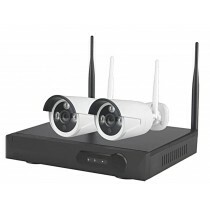 This is a great little low-cost Wireless CCTV Kit, complete with 2 X HD Bullet cameras, incldung power supplies and a 1TB 8 Channel recorder. Ideal for smaller properties, or yards with large open areas. The very latest 5MP Two Camera Kit from HIKVision. 5 Mega-Pixel cameras are 2.5 times sharper than Full HD cameras for exceptional quality. Introducing the very latest in Ultra-Sharp 5 Mega-Pixel CCTV Equipment at very special pricing from the World's leading manufacturer of CCTV equipment. We are delighted to announce that we now stock the HIKVision range of 5Mega-Pixel Turbo Analogue HD recorders and cameras. This new range features amazing HD quality at 5MP quality, 2.5 times sharper than 2MP 1080p Full HD! What it means to you is that you now get amazing HD quality in an easy to install package with everything included. The 2 channel Kit comes with a 1TB Hard Drive as standard. 5MP uses up more HDD space, so a small 500GB hard drive just won't be enough. This is the new DS-7204HUHI-K1 with H.264+ & H.265+ compression. When enabled it will more than double the storage capabilities of the recorder, giving it equal storage to a normal 4TB H.264 recorder. This is our lowest cost 5MP High Definition HIKVision Kit ever and it uses the very high quality HIKVision premium Turbo brand. It costs less, but you do not lose out in quality. Even more incredible is that the included HD cameras have the best IR NightVision in their class. The dome cameras can see in total darkness for upto 40 metres and the optional bullet cameras can see an amazing 80 metres in total darkness. Both of these cameras are far, far better at night vision than comparable cameras from other brands. 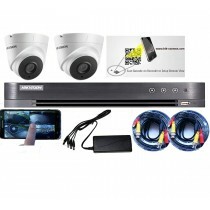 This is our lowest Cost High Definition Security Kit Ever. Featuring the latest Full HD TVI Technology, this budget kit doesn't scrimp on features or quality. No more blurry images, what you get is clear and sharp footage, some of our customers have said it is like watching a movie on Sky HD!. The camera comes with a large 1TB Hard drive, which should be enough for more than a month's recording when set to motion detection and 12 frames per second. 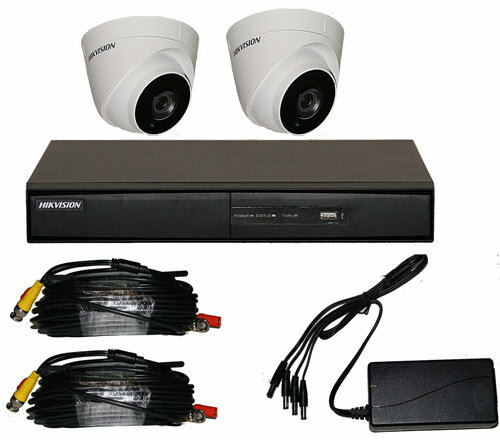 Single camera CCTV Kit with High Definition Realtime CCTV recorder and HD 2MP External camera with 25 metres Infra-Red Night-Vision. 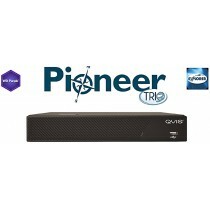 You can coonect this system to your TV or a spare computer monitor. This recorder, like all of our recorders, can allow you to view the camera remotely on your iPhone, iPad, Android, laptop or windows Smartphone anywhere in the world when connected to your broadband. You can easily add three more cameras as you need them, up to a maximum of four.